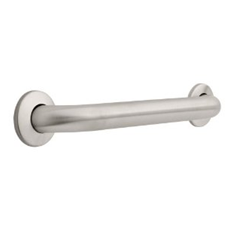 Despite their appearance and convenient locations, towel racks are not substitutes for grab bars. If a towel rack was needed to regain balance or to prevent a fall, it could be pulled off the wall. For this reason, it is recommended to have grab bars installed in or around the tub and shower area. The standard safety bar is relatively inexpensive and can be purchased from your local hardware store. These are installed into the studs of the wall and in some shower stalls or tub structures. It is recommended that safety bars be installed either vertically or horizontally to decrease the risk of your hand slipping on an angled surface. An experienced handyman will ensure the grab bars will tolerate force and do not interfere with the plumbing or structural integrity of the shower or tub. Safety bars can be ordered in a variety of colors and lengths to best compliment your bathroom decorations. For showers that cannot support the installation of safety bars, the suction cup grab bar may provide safety within the tub or shower. These must be applied to smooth surfaces—extreme caution should be used if applying these to a tile interior as the grout may hinder the integrity of the suction. Furthermore, the integrity of the suction should be checked periodically for safety. If your tub is free standing, a vertical pole will provide support during transfers in and out of the bathtub. 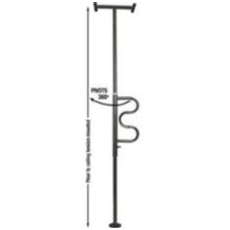 This pole extends from the floor to the ceiling and should be located 15 to 18 inches from the water controls and close enough to the edge of the tub that the individual can access it from a seated position. Bathing may be difficult for individuals who experience discomfort with prolonged standing or have challenges rising from the floor of a bathtub. Several options for tub benches exist and are compatible with either a walk in shower or a bathtub. When using any seat, it will be beneficial to install a hand held shower to simplify bathing. 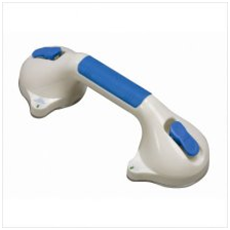 To select the most appropriate equipment, it is best to seek recommendations from an occupational therapist or physical therapist. 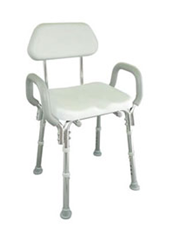 This piece of durable medical equipment is the most versatile as it may be placed near the bed and used as a bed side commode or over the toilet for a raised toilet seat with hand bars. With the pale removed, this seat can also be placed in a tub or a walk in shower. Place the seat so it faces the entrance of the shower to provide greater leg room. 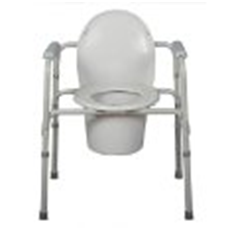 With the pale removed, the commode seat opening allows an easy way to wash genitalia. 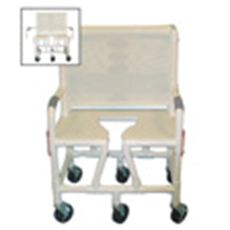 A shower chair provides a seat in a shower or tub. A taller perch chair may also be used if you need light support or something to lean against. It is recommended to purchase a shower chair that has arm supports. This will provide more support and balance when transferring from standing or sitting. These benches are wider than the width of a standard bathtub and designed to have to legs to sit inside the tub and two legs to sit outside the tub. 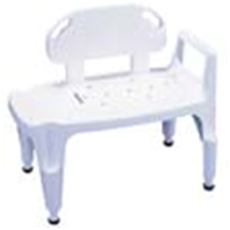 To safely use this bench, sit on the outside edge of the bench, lift your legs over the edge of the tub, and slide across. The bench on rails requires less energy as the seat slides across the tub edge, eliminating the need for the individual to shift their body weight. 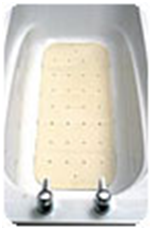 These transfer benches can be used for bathtubs as well as some walk in shower stalls that have a lip. It is important to measure the area available around your shower to ensure that you will have access to the shower and toilet if using a transfer bench. 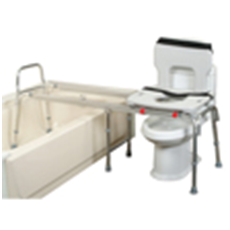 If your toilet is next to the bathtub, a transfer bench that extends across the shower and the toilet may provide the most convenient access to your shower while also providing a raised toilet seat. Shower chairs provide access to walk in shower stalls that do not have a lip. Before making this purchase several considerations are necessary. First, is there space in the bathroom to transfer from the standard wheelchair into the shower chair? If there is not space in the bathroom to complete this transfer, it must be completed outside the bathroom. If the outside room is carpeted, it will be more challenging to push the individual in the wheelchair. These chairs will also be difficult to maneuver over a small threshold at the entrance to the bathroom. To overcome these two challenges, choose a chair with large back wheels. However, you must ensure that the chair will fit through the bathroom door as the larger wheels expand the width of the chair. Bathmats in the shower are helpful to assist with stability when balance and leg strength is limited. Bathmats may also assist with transfer safety by holding the individuals feet in a safe and appropriate place. When considering bathroom flooring, bathroom rugs can pose significant fall risks. An individual who has decreased leg strength or awareness may not lift their foot high enough to clear the rug, and may result in a loss of balance or a fall as a toe catches the edge of the rug. For this reason, it is recommended that bathroom rugs be removed. 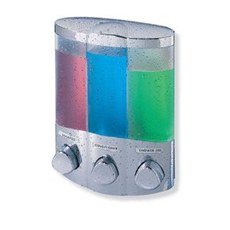 Shampoo and soap dispensers can be purchased as decorative features for your shower. These may be installed with heavy duty two sided tape or screws. Consideration should be given to the height in which this device is installed. If you use a shower chair or bench (or plan to in the future) this should be installed at a height that is easy to access from sitting. Furthermore, if you experience weakness of your shoulders or elbows, you may wish to install this around waist height to reduce the amount you must raise your hands to access the device. These reduce the amount that you must lean and reach while taking a shower. They may also enable independent washing of your back and feet while bathing. With a handheld shower head, an individual can easily direct water onto themselves or someone for whom they are caring. These are particularly helpful if using a shower chair as sitting prevents an easy shift from under the running water. 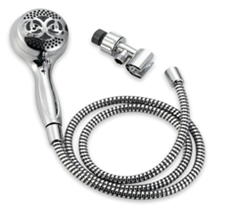 When not in use, the shower head can hang and be within easy reach for the next bath.